We’ve had a lot of birthday around here the last couple of weeks. Both of my boys have early summer birthdays so between family parties and friend parities, I’ve been making a lot of cupcakes, and I still have to make one more batch of cupcakes for Sunday. I’ve been eyeballing a Chocolate Chip Cookie Dough Cupcake recipe for a while now, so I’m planning on making those. Then we will move on from cupcakes to something else. Maybe pies. I’ve never made my own pie before, and have always wanted to. So that will probably be in the works soon. But anyways, back to these cupcakes. I was in charge of playing hostess for my husband’s dad, which means cooking dinner and then providing something for dessert that we could use to sing Happy Birthday to both boys. Since making a whole cake wasn’t ideal, and I was also in charge of dinner I figured lets make some cupcakes from a box. But then I feel bad, cause that’s no fun either. Then I saw this recipe!! It adds a fun twist to boxed cake while still keeping things easy. 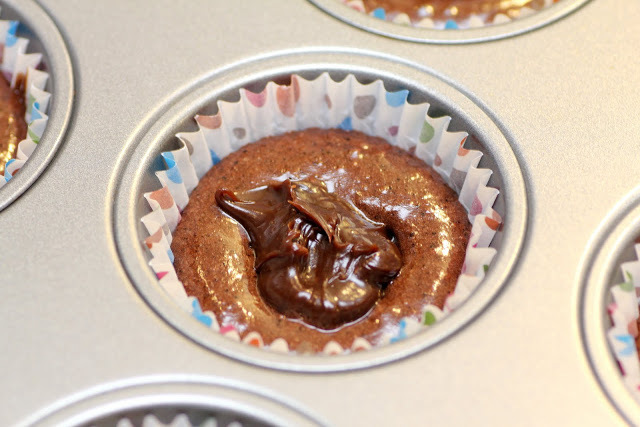 You add a spoonful of hot fudge ice cream topping on the batter before you bake the cupcakes, so the fudge stays gooey in the cupcake which made these cupcakes tasty and interestingly different and so so yummy!! The only thing I wasn’t the hugest fan of was the frosting. If you like shortening based frosting, then disregard this opinion, but I really don’t care for shortening, unless it’s in something that needs to be like and flaky. So if I were to make this recipe again, I would make the Float Frosting that goes with the Root Beer Float Cupcakes. It’s butter based, which I prefer the flavor to shortening based frostings, and it implements vanilla ice cream into the frosting, so I think it would go really well with the fudge cupcakes. I would highly recommend switching out the frosting and I think that these cupcakes would be a thousand times better. Enjoy!! Preheat oven to 350 degrees. Line twenty-four 2 1/2-inch muffin cups with paper bake cups; set aside. Prepare cake batter according to package directions. Spoon batter into prepared muffin cups, filling each about two-thirds full. Use the back of a spoon to smooth out batter in cups. Place a scant tablespoon room temperature ice cream topping on the top center of each cupcake. Bake for 16 to 20 minutes or until tops spring back when lightly touched (While baking prepare Creamy White Frosting). Cool cupcakes in muffin cups on wire racks for 5 minutes. Remove cupcakes from muffin cups. Cool completely on wire racks. Spread some of the frosting over each cupcake. Place the remaining frosting in a pastry bag fitted with a star tip. In a small saucepan melt the chocolate pieces and shortening over low heat; cool slightly. Spoon melted chocolate into a small heavy resealable plastic bag. Seal bag; snip off a small piece from one corner. Drizzle chocolate on top of frosted cupcakes. Sprinkle cupcakes with nuts. Pipe the remaining frosting on top of cupcakes. 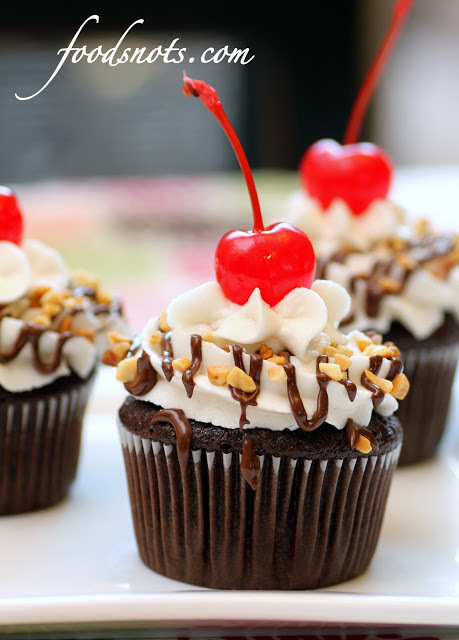 Place a cherry on top of each cupcake. Makes 24 (2 1/2-inch) cupcakes. 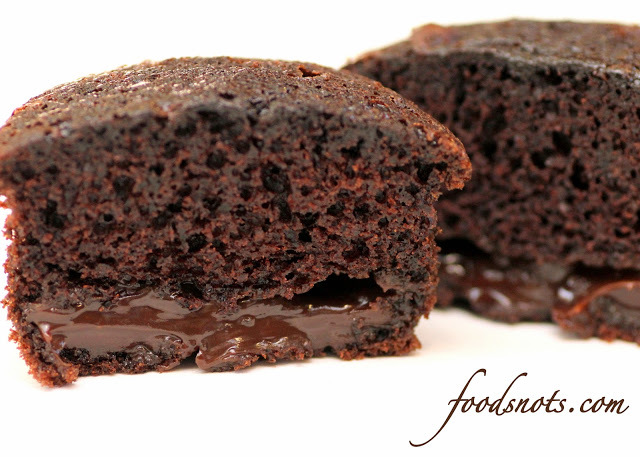 *Test Kitchen Tip: If desired, use Smucker’s magic shell instead of melting the semisweet chocolate pieces and shortening. In a large mixing bowl beat shortening, vanilla, and almond extract with an electric mixer on medium speed for 30 seconds. Gradually add 2 cups of the powdered sugar, beating well. Add 2 tablespoons of the milk. Gradually beat in the remaining powdered sugar. Gradually add enough of the remaining milk to make frosting spreading consistency. Makes about 3 cups.